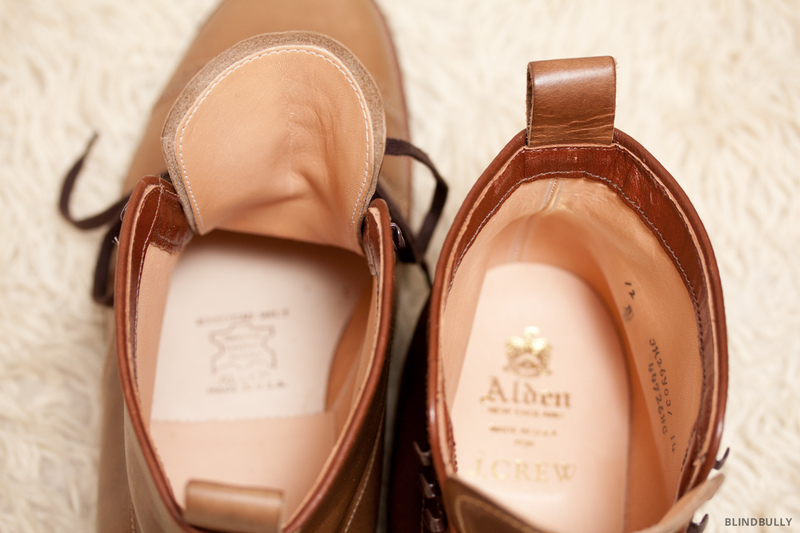 Alden for J.Crew Natural Cap Toe Jumper Boot (size 12). Fits like a boot, so order a size 12 if you wear a size 13 dress shoe. Made in the USA on Alden’s Barrie last. Since Alden offers many styles and frequently collaborates with vendors for custom runs, it can be hard to find exactly what you’re looking for. To help, here is a short list of retailers: Unionmade, Need Supply Co., Leffot, Epaulet, Leather Soul Hawaii, Winn Perry, J.Crew, Barneys NY, The Shoe Mart, Alden of Carmel. As the name implies, natural chromexcel leather has natural variations in shade and color, but over time will patina into a beautiful golden hue. Some folks want their boots to look a certain way from day one, but with this leather the owner is a part of the final process and as the boots are worn and exposed to the elements they’ll gain character and darken into their final color. As for the style of the boot, the toe broguing is on trend, but I still prefer a simple cap toe with boots (even if broguing was born in bog boots). Other details include an abundance of eyelets and speedhooks that help to define Alden’s aesthetic refinement. Inside, the smooth, vegetable tanned, leather lining fully covers the interior (including the tongue) and creates an incredibly comfortable boot straight out of the box. These boots are easy to put on with a large entry area provided by the speed hooks and lack of a gusseted tongue, but with that comes a lack of protection from the elements (if it’s really pouring/snowing). The laces don’t feel all too durable, but Alden throws in an extra pair, which is a nice gesture since speed hooks frequently decrease lace longevity with their sharp edges. 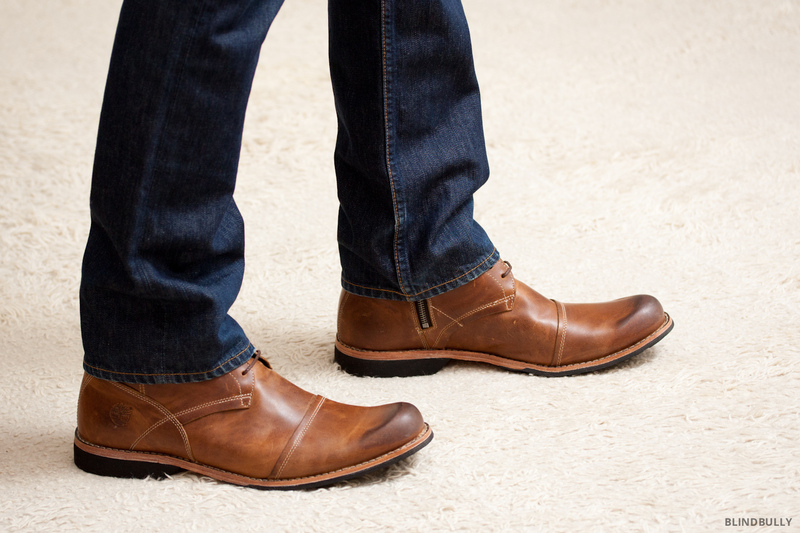 Well made with a Goodyear welt featuring the highest stitches per inch in the lot. The commando (rubber) soles have an appropriate tread depth for a winter city boot to provide some traction in snow, without having to clomp around on half inch lugs. Unlike on Alden’s stacked leather soles, the lock stitching on the commando sole isn’t channeled, but since this doesn’t appear to result in any reliability issues, it’s just an OCD observation on my part. These beautifully designed and expertly crafted boots are easily my favorite of the bunch. If you have the money you won’t be disappointed when you take these out of their box. Oak Street Bootmakers Natural Cap Toe Trench Boot (size 13). Very well made and true to length, however the boots are a bit wide. Made in the USA. First read the Alden review above, since these boots are made with the same chromexcel leather and are thus a good example of the variation in color that is to be expected. Compared to the Aldens this pair of Oak Streets have a bit of a sickly hue, but they will both patina similarly, yielding to a golden hue in time. (Purely conjecture: The sickly color could be from the Chromexcel process that uses chrome salts to speed up the process, before a secondary process with natural tannins. Thus the leather has a “wet blue” phase, that since it’s never truly dyed, could be the cause of this almost blue/green tint.) Style wise the broguing is minimal, with a clean edge rather than Alden’s wavy half crescent edge, but I still find it unnecessary. The Oak Street Trench Boot is very comfortable straight out of the box with a calfskin vamp lining (same as Red Wing Beckman and Wolverine 1000 Mile) and well-designed tongue that lays smooth across the top of my foot and ankle. The leather laces are the perfect length for wrapping around the top of the boot, which is both stylish and a good alternative for quick lacing without using hooks, which some people don’t like due to the increased cuff damage and tripping hazard. The Oak Street Trench is a true goodyear welt, but they have yet to release their rubber Dainite soles in the cap toe, so these are a smooth, stacked leather, waterlock sole. 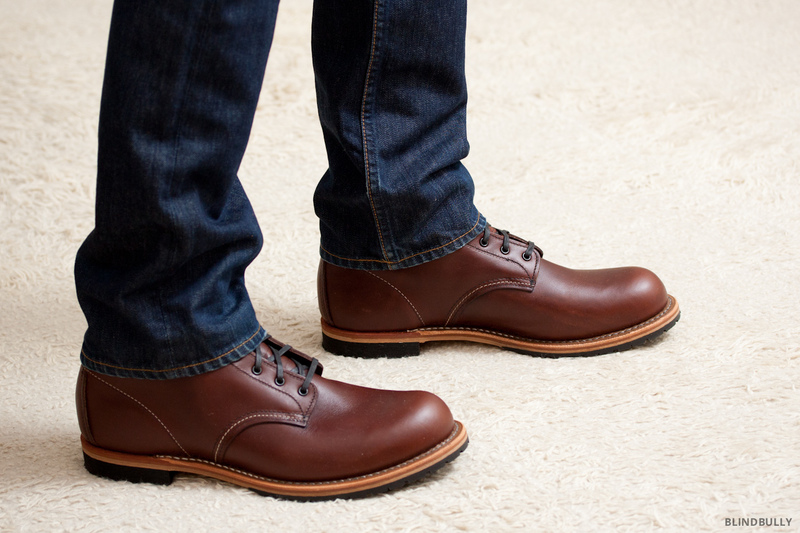 Oak Street makes a really nice pair of boots with top notch craftsmanship, they’re just a little wide for my foot and I wish they offered Dainite soles in this Trench style. Red Wing 9016 Beckman in Cigar Featherstone (size 12). The fit is typical boot sizing; one below your Brannock size. Made in the USA. The Beckman is made with strong leather and designed with a vamp calfskin lining as well as a gusseted tongue for weather protection. Unfortunately, the tongue on my pair was made of a thin, dry, stiff piece of leather that didn’t sit flat against my foot/ankle. Thankfully, it appears to be an isolated case, as I’ve checked other Beckmans and haven’t found the problem on any other pairs. The top edge of the boot also had a thin, black rolled piece of leather trim that was stiff and felt cheap, but I’ve compared this as well, and found other Beckmans to be constructed with better, softer, leather, so again, just check what you’re getting. The laces are waxed, but too short, requiring constant restringing of the top eyelets. Thankfully that’s easily solved with a new pair of laces for under $10. The Beckmans are made with solid Goodyear welt construction topped off with a rubber sole for snow traction. Similar to the Aldens there is no channel for the lock stitching to recess into, but also similar to the Aldens, these boots don’t have delamination issues, so it doesn’t seem to be an issue. The insoles are vegtanned leather that’ll take a little while to conform to your foot, but should last a good long time. 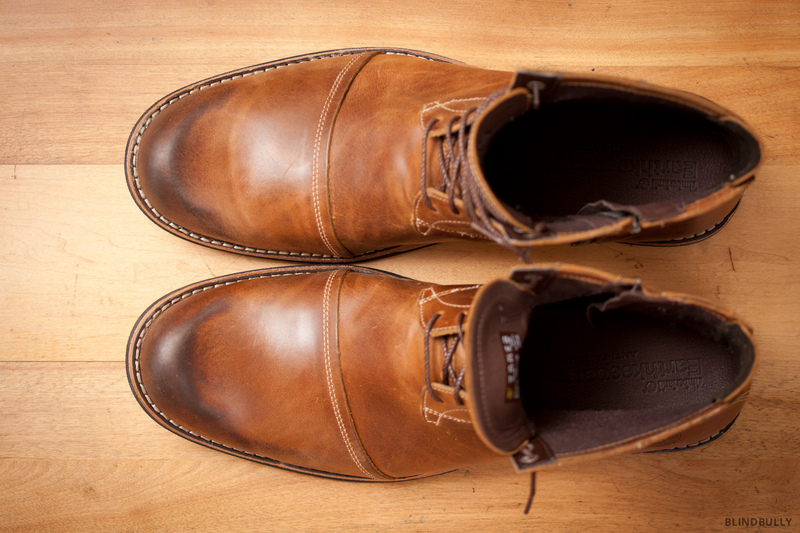 This can be a handsome boot, but given my anecdotal experiences with this pair of Beckmans and my Iron Rangers, I recommend double checking the quality control yourself–or better yet, buying in a store. Wolverine 1000 Mile Rugged Boot in Brown (size 12). Order one size smaller than your Brannock size. Made in the USA. The burnished edges along the top are aesthetically preferable to the Beckman’s leather trim, however I’d prefer if Wolverine hadn’t embossed the leather with “1000 Mile” along the top. Some folks recommend conditioning new boots before wearing them to ensure the leather’s ready for weather, but that’s unnecessary for the 1000 Mile Boot. The leather arrives with a waxy sheen, as if the final coat of wax/oil wasn’t fully buffed off, which keeps the leather conditioned through storage and transit. Because of this the leather is very soft and water repellent from the get go, as well as very comfortable. Similar to the Oak Street Trench and Red Wing Beckman, the vamp on the 1000 mile is lined with calfskin. To top them off, the laces are waxed, the perfect length, and a good color. The eyelets are an antiqued brass, which is also my color of choice. Traditional goodyear welt construction with channeled sole stitching to prevent premature wear. The 1000 Mile outsole is made with stacked leather as is the heel, which is then finished with a piece of rubber for slip resistance. 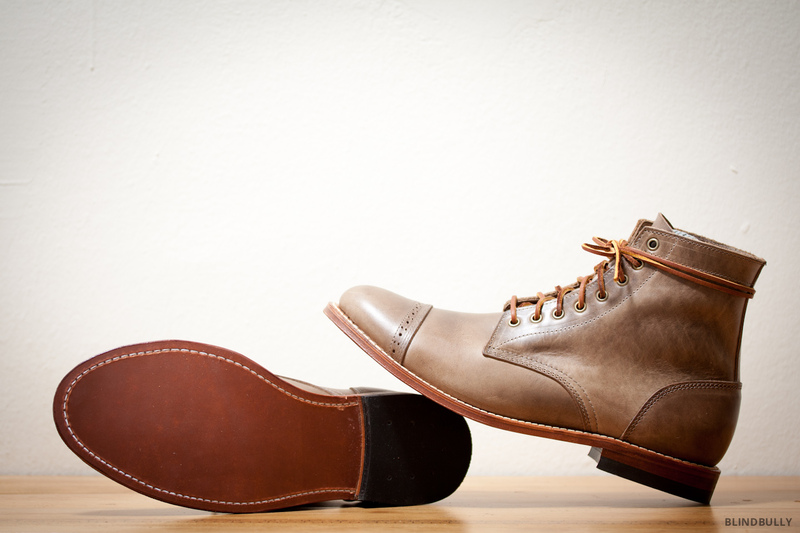 These are solid boots that can be made even better by your cobbler with the addition of some half soles for winter. UPDATE Nov. 12, 2015 | There have been reviews on Amazon and Styleforum indicating that the heels are prone to falling off due to an all tack and no glue application method. As such I’d be cautious with this boot. It seems like it’d be an easy fix for a cobbler, especially if you’re having the half soles attached, but no one wants to have to deal with taking a pair of boots to the cobbler because the manufacturer didn’t do their job. There have also been issues with factory seconds being sold at full price on Amazon, which is concerning in a whole different way. (Thank you Enzo for the comment). Timberland 6 Inch Zip Earthkeepers Boot in Burnished Tan (size 13). True Brannock size. Choosing to use leather from a “Silver Rated Tannery”, recycled plastic, recycled rubber, and organic cotton laces is commendable. Made in China. 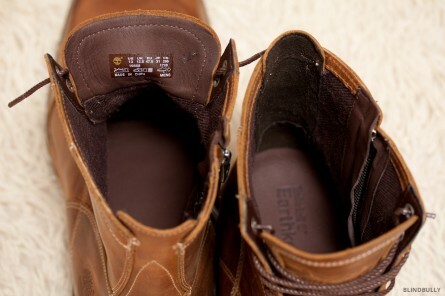 The best thing about these Earthkeepers boots is the excellent color of the Burnished Tan leather. Unfortunately, the interior is lined with a synthetic fabric that wears out much faster than one made of leather, which ultimately renders the boot uncomfortable and destined for landfill. Additionally, the structure of the heel cup and toe box is made of plastic since the leather is too thin to hold the shape on it’s own. The toes are also unnecessarily long and the burnishing on this specific pair (but not all) was poorly done with a very rigid and unnatural cutoff point where the plastic toe box ended. Not a true goodyear welt, but they channel the sole stitching and the shoes are comfortable. If the liner does last the soles are very thin, so resoling can be problematic (I’ve tried in the past, but it was unclear if it was an impossible task or the cobbler botched the job). Given the other boots will last much longer if well cared for with basic maintenance (periodic saddle soap + Obenauf’s) these are cheaper in the short term, but more expensive over time. 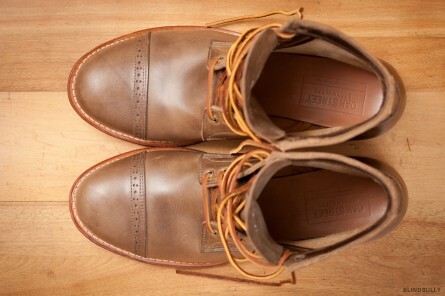 Hi there, a great post and could be my boots shopping guide! I will appreciate if you could share suggestions for taking of these boots. I applied red wing boot oil on my timberland zip boots (burnished tan), and the color turned into black immediately, and left several black dots in my boots. No way to get rid of them. Great article! Would love to see the Beckman vs. Wolverine in black. Thanks Robb, I’ll keep you posted if I get a chance to shoot them. The broguing on the Alden and Oak St boots are seemingly identical….yet you claim its a negative for Alden and a positive for Oak St. The crescent edge is the difference, but you’re right, the hole patterns are similar, just slightly different scale. You’ll find I’ve adjusted the columns to match; my thought was the clean edge was better than the half moons, but I do find any broguing on boots to be unnecessary ornamentation and thus a negative. What kind of jeans are you wearing in those pics? Thanks for asking, I’ve added a link to the jeans manufacturer to the top of the post. They are Bonobos Premium Denim Flatiron Dark Rinse Slim Straight Jeans. If you use the link you’ll get $25 off if they’re your first Bonobos purchase. I was this close to pulling the trigger on some Beckmans when I stumbled across this post. It seems you saved me from some buyers remorse! I wound up opting for some 1000 Mile Courtlands (the moc toe model with a rubber sole) and I couldn’t be happier. Thanks! Thanks for the comment, I’m glad you found the post helpful! It’s disappointing seeing people putting stock in your initial impression. Especially if they are looking at your review with regard to build quality. You clearly do not understand very much about shoe construction, especially in regard to stitching. The channel stitching is stitching is made using a lockstitch. Lockstitches are independent of one another and the thread is waxed. IE if a single stitch becomes compromised, or even several in series it does not effect the structural integrity of the channel stitching. It does not matter if the stitches are recessed into the channel. 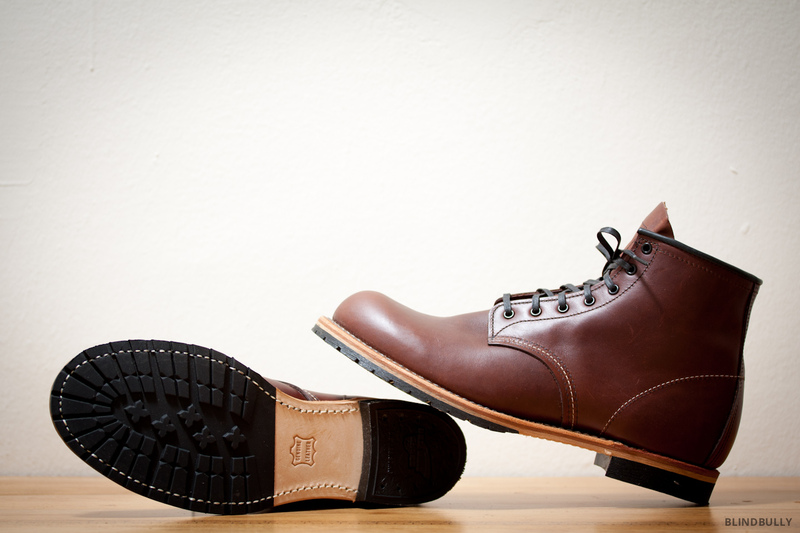 Smokeumper boots built by Whites, Nicks, etc…that are built to much higher standards are often built without recessed stitching. 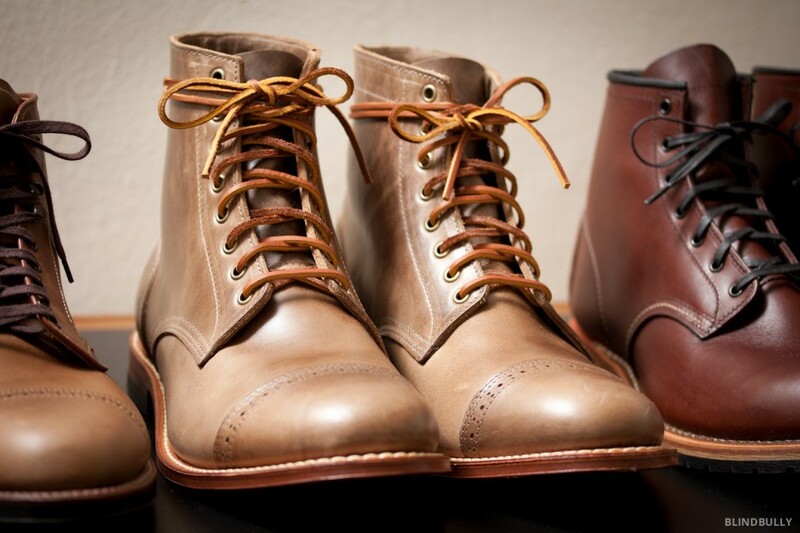 To top it off, you do not mention the insole quality of any of these boots, which is the most integral part of GYW construction. Thank you for the condescending comment; I’m aware of lock-stitches and how they work. If a series of stitches are all destroyed along a continuous section of the sole (as is likely when they’re on the wear surface) it’s just the shear friction of the waxed thread (and adhesive) holding the welt to the sole rather than the whole loop of thread that would distribute the load along the length of each stitch. Thus, without the use of adhesives, the sole would begin to detach from the welt. Thankfully, everyone uses adhesives, so it’s not a big deal. Ideally though, companies would all stitch in a channel as it is the “best” technique. Also, I took photos of the insoles of the boots and figured that’d give people a decent idea of what they’re like. Obviously all these boots are new, so I don’t have months of use to report on, which is why it’s first impressions. Fair and agreeable answer. 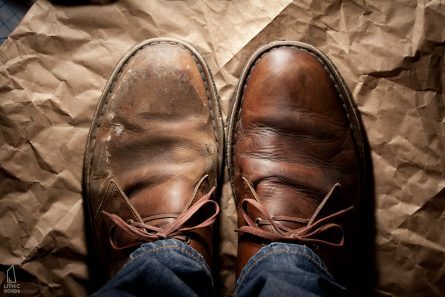 I’m old timer, been a cobbler for 50 years and have seen the evolution of shoes. Some good, some bad. Comfort-wise, tremendous leaps of improvement, no doubt. Build-quality wise, I don’t know. But then, the companies have been able to get more comfortable shoes on to the feet of a lot more people. But if we limit our gaze to aficionados such as the motley gang here dissecting these boots, I think the quality of shoes have gone down. Maybe I’m too old, please feel free to flame me. But how can a shoe made in the assembly line even match the precision and ‘eye-work’ of a master craftsman? Am I wrong? By the way, everyone seems so obsessed over goodyear welt because all these shoes are made in the factory. A bespoke shoe made by hand by a skilled master cobbler does not need Goodyear’s or anyone else’s foreskin. If you gentlemen have been spending hundreds each year buying these shoes, why don’t you give a bespoke cobbler a chance. it might cost double what you pay but it might last double the time and, of course, it would be your creative design, Wouldn’t that be attractive? Cheers! Double? The Red Wings are $300; truly bespoke would be, what, $4,000? That’s a bit much for most of us. Are cobblers paid so much that they would find that reasonable? 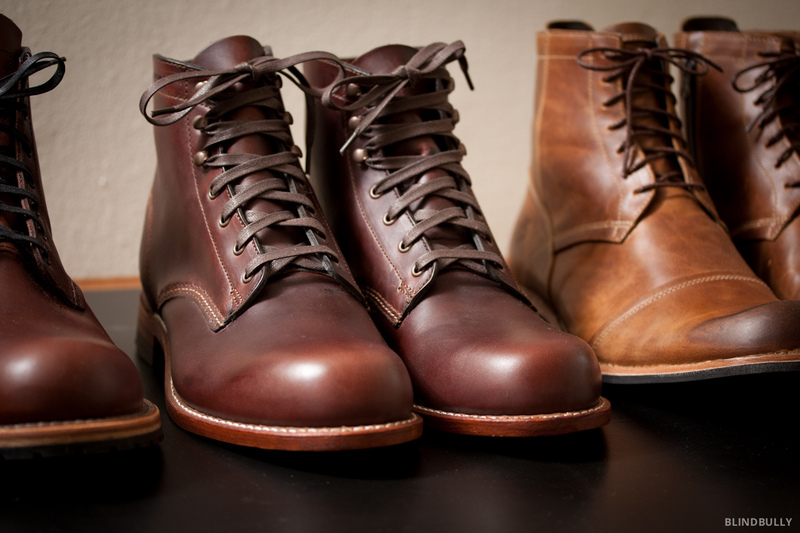 I don’t know about the other companies but at the very least Oak Street boots are all hand made by master cobblers with 20+ years of experience (with one exception), taking ~6 weeks to make each pair. Their owner says he can tell which of his cobblers did the stitching on any given pair of Oak Street boots because they all have distinct tendencies. I believe Alden has similar standards for employment. At least those two companies intend for their products to be able to last a lifetime if you actually take care of them, much like a pair of bespoke boots, but for a much lower price tag. Thanks for your comment. At the top of posts I always include links to the products along with the specific make, model, color and size. Following that link just now, I can confirm that they’re in stock on Amazon. 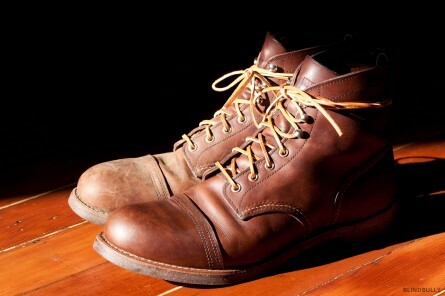 The photos in this post are of the “Timberland 6 Inch Zip Earthkeepers Boot in Burnished Tan (size 13)”. Amazon stocks three colors and Burnished Tan is what you’re after. Would those Aldens be suitable for the snow, or do you think the salt and slush would ruin the leather? Great review! Thank you for the comment, I’d say they would work in the snow & slush. One thing to note is the tongue isn’t gusseted, so if you stepped in a deep puddle or got slush up on top of the laces, it could sneak around the tongue, but that depends on how aggressive you are in the winter. As for the salt, any leather is going to be upset about it, but if you keep your boots in good condition throughout the winter, they’ll be fine. Also, never dry them with a heat source, just let them dry slowly. 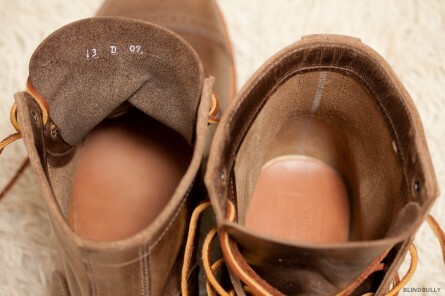 If salt stains do show up, just wipe your boots down with a damp rag and re oil/wax/condition your boots to try to prevent water from being able to soak into the leather in the first place. 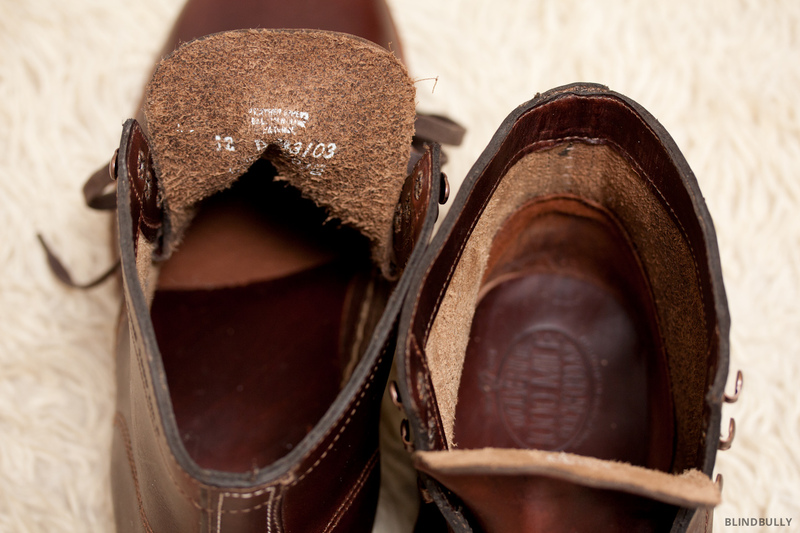 Check out my desert boot post, it has a before/after with some salt stains. The Timberland one is even welted, not just fake stitches? I’ve been looking at the beckmans and 1000 miles for quite a while now. I will be studying in london from now on and need a decent pair of boots that will does a great job in rain and snow perhaps. People say the beckman is more durable in terms of leather because it’s more stiff, is that true? And how is the durability of the 1k compared to the beck? I do love the 1k they look absolutely gorgeous. The beckman is also great i just dont like the bulbous toe box and the lack of speedhooks. Tell me what you think I should go for. Thank you. Thanks for the informative article! I would love to see the Alden vs J Adler. By J Adler do you mean http://www.adlershoes.com/ ? I haven’t seen them before, but their London Boots S or W look nice. Size 13 is +$20, and I’d prefer a commando sole (which might be on the winter boot) in Light Brown, but they do look very nice. Thanks for the tip off! So what’s your top pick? The Aldens? Ultimately it depends what you’re after. I’d say the quality of construction is best on the Alden’s and they were very comfortable out of the box, so if you have the money to spend and like their style, I’d recommend those. 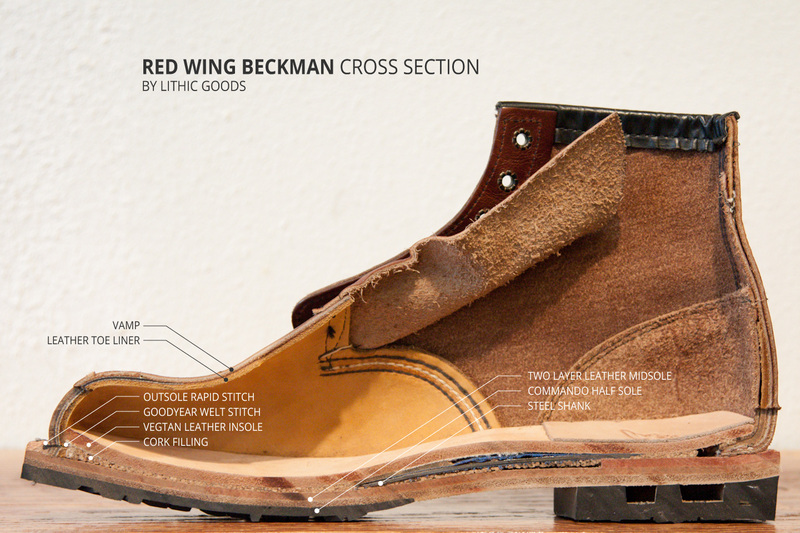 The Beckman’s had thin leather tongues, but if you have access to a Red Wing store you can take it upon yourself to handle quality control and get a pristine pair that doesn’t have a thin crinkly leather tongue or any other defect. But I wouldn’t buy them online because of this issue. If you don’t need a rubber sole, then you should check out the wolverines. If you have wide feet check out the Oakstreets. 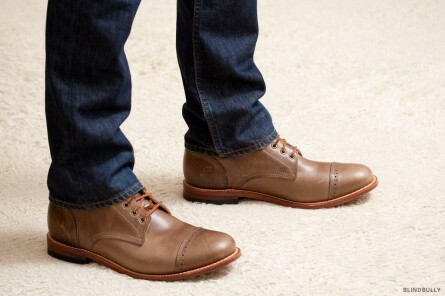 These boots are nice but for the average working man they are way over priced. No wonder American businesses cannot compete even though the quality is there the prices are ridiculous! Wicked post!! I’ve been looking for a boot and have been tossing up between the red wing beckman, 1000mile and the oak st commando trench chromexcel which ive only found here (http://www.cultizm.com/product_info.php?info=p5329_Oak-Street-Bootmakers-Commando-Trench-Boot-Black-Chromexcel.html). 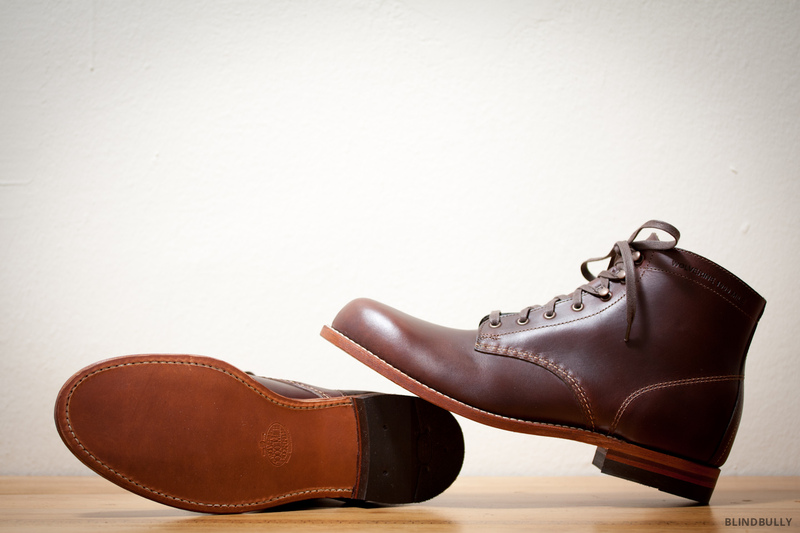 Have you come across the viberg x 3sixteen? If so how does it rate as compared to the above? Thanks for the review. 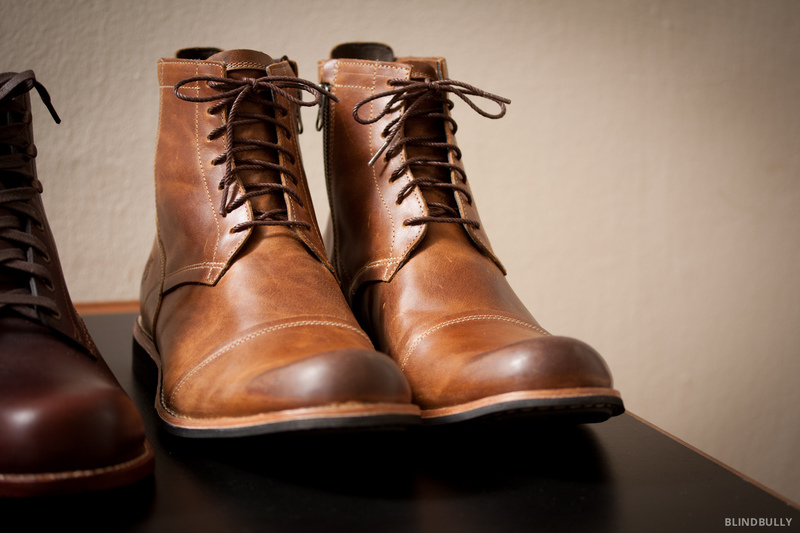 I have the Oak Street boots and love the style and construction. However, I found that the color for mine appears much lighter than the ones shown on the website which I would’ve preferred. You made an interesting point about the color being “sickly.” I wonder if it has to do with how the photos appears on their website vs. reality. Thanks for the post. I actually prefer a lighter color, to allow the leather to patina a bit more on it’s own. What made mine “sickly” was a very slight green tint that would likely disappear with time. And this is chromexcel leather, where each beast is unique and there is variation from batch to batch, even if it’s unintentional, there is no dye to hide it. On the oak street website they have more of a golden hue, which would have been great, just a touch darker than the Alden’s, but lighter than a brown and no green. Hopefully in a couple weeks yours will darken to your liking. You could also oil them, which will darken them instantly. 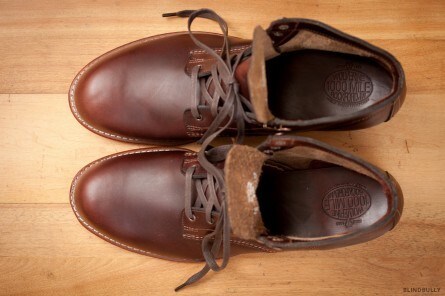 Have you had a look at the Timberland Coulter 9-Eye Boot? Curious as to how it compares. Thanks for the heads up, it looks like Timberland is joining the American Revolution. I’ll check them out for my next comparison. 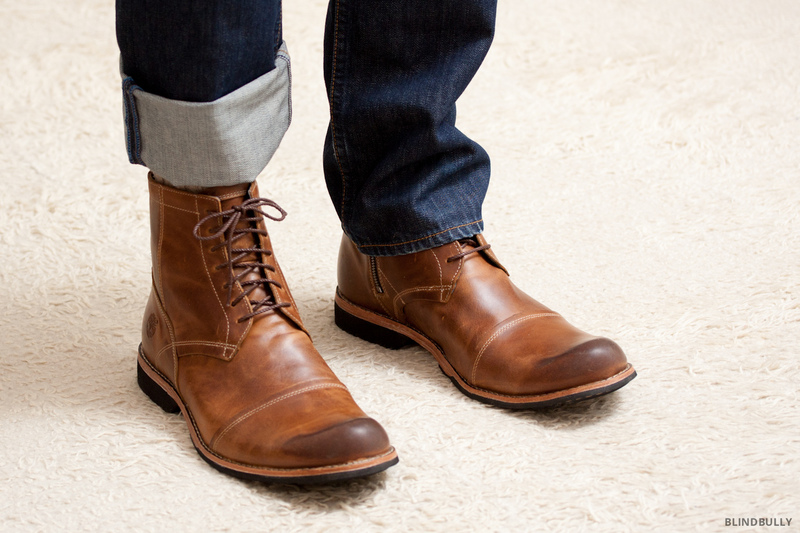 Curious how these boots compare/ contrast to similar ones made by Frye (Logan, James, Arkansas, etc). Obviously you can’t list every boot out there but was wondering if you or any other have tried the frye boots and, if so, what your impressions were. Hi Ben, thanks for the comment! I’m on the road this week, but I’ve got a pair of Frye logans at home right now. I I actually already have a teaser picture up, if you click “shoes” in the navigation you’ll see them (and the review soon). Thanks for all of this; better reviews/descriptions than from the shoe companies, store reps etc. Thank you for your post and I’m glad you found it helpful! I’m not sure what the width of the Oak Street Trench would technically be, but I wear a 13D in AE, so given that the OS Trench felt wide to me and the Iron Rangers a bit narrow, I expect you’ll find them darn close to what you’re after. They’re customer service is friendly and helpful, so I’d recommend reaching out to see what they think. Good luck! Tried the Oak Street on in a store in the village (lovely place but not lovely enough to pay $125 more than directly from the company!). Ordered them online, got them today, feel great so far, now I’m just questioning if I’d prefer the cap toe instead of the dark red/tan, and where to get a winter sole put on. Usually go to is the place on 10th & Greenwich (something with a H). Any recommendations for where to have the boot winterized in NYC? Thanks again! Would you say that the same positive themes exist for other Alden boots as compared to these, which have a specific affiliation with J. Crew? Obviously, one wouldn’t expect the quality or craftsmanship to deviate to a large degree, I just wanted to hear what your views were of the other boots in Alden’s line. Thanks for the insights; it’s very helpful. Thanks for the comment, I’d say that yes, the same positives in terms of construction exist for all Alden boots. The design elements will obviously be boot style dependent, but I expect the J.Crew affiliation to have no impact on quality of craftsmanship one way or other other. 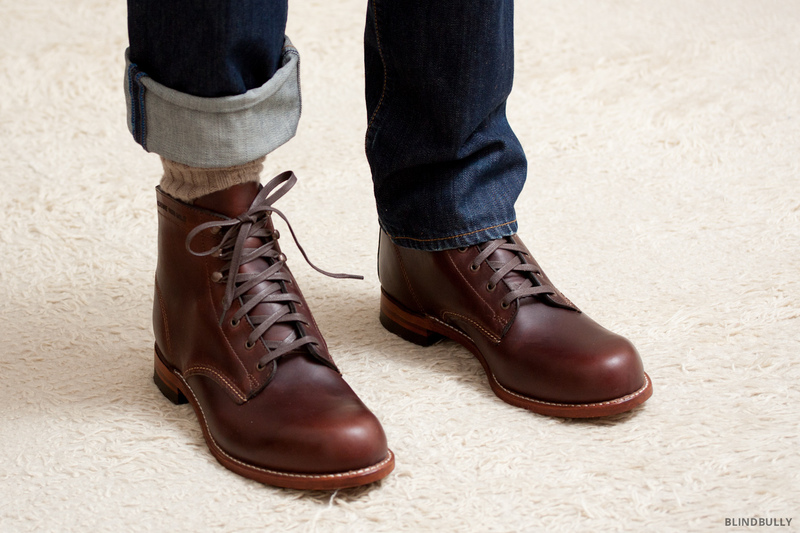 I don’t know how the Alden collaboration works (if you do, please comment with your knowledge) but my guess is Alden has a catalogue of styles and a catalogue of materials and J.Crew picked their Jumper Boot in Natural Chromexcel with the commando sole, brown eyelets, speed hooks, and laces. Very similar versions of the boots are made by Alden for other companies who also collaborate. Is it possible for you to do a review on White’s Traveler boots and their semi-dress boots? I purchased the Timberland boots since you didn’t destroy their quality and I love their style the best out of all of these. They also happened to be the cheapest. The pair I bought from Macys in burnished tan don’t seem to have the burnishing on the toe but look rather uniform throughout. Is there a specific model that comes like this? And I there a way I can create that for these boots? I’ve been looking to purchase the OS Trench Boots Natural, but I’m having an issue with pulling the trigger. I hate the fact of spending that amount of money without having the chance to see the boots/trying on the boots in person. I have read, from your article and others, that the boot runs large, and the leather tends to stretch over time. I wear a 10 in all of my shoes/boots, but I am wondering if I should purchase 9.5 in the Oak Street boots because they are said to run large. Could you please give me some advice? Should I buy a 10 and let the boot run wide, or buy the 9.5 and let it be more snug and hope that the leather stretches to the perfect size? Great choice with the OSTB, if they fit you’re going to be pleased with your purchase. Have you tried on any of the boots I’ve written about? While you might be a size 10 in all your current shoes/boots, it’s likely that these will fit differently, since most run large for their size. To try to help I include the size information in these posts, I normally wear a 13 in shoes, but a 12 in boots, because of this convention. Thus, I’d recommend buying the 9.5’s as they’ll pack out a little and it’s better to start with a snug but comfortable boot than a loose boot that becomes even looser. I have not been able to try on any of the boots in the article. Living in a small town doesn’t give me much opportunity haha. But I did read that you reviewed the OSTB in a size 13, but for most of the other boots you reviewed a size 12. Do you feel like the OSTB would have fit you better if you would have tried on the 12 size or maybe even a 12.5? You said that the boots runs wide but true in length size. I don’t know if you are still looking to buy the osb. But I wear size 8 in red wings and 8.5 in osb. Hope that helps. I believe they run true size. Just came across this site and love the reviews of the boots. I know you are an American based site but any opinion on my British made Loake Dovedale. They have been great over the winter. 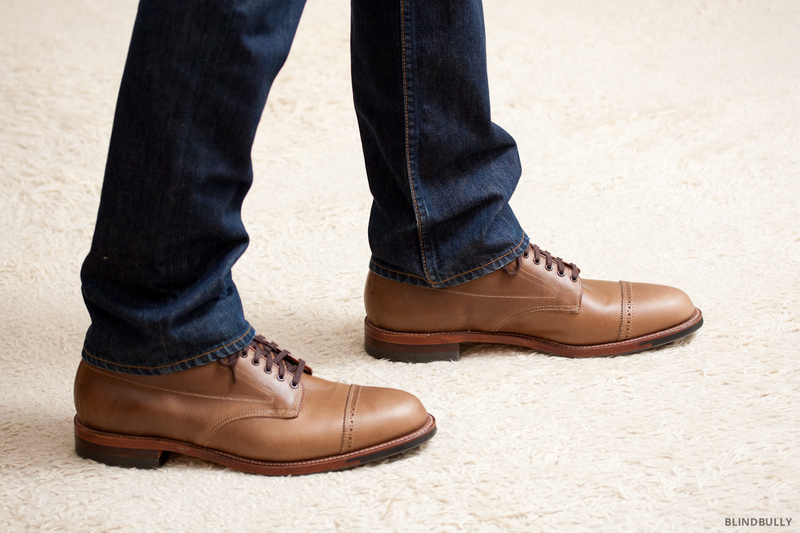 The sole has lots of grip and they look good with jeans or at the office. Thanks for the comment. I’ve never heard of Loake before, but the Dovedale boots do look nice. I’ll have to see if they’re sold in the US to consider reviewing them. Thanks for bringing them to my attention. Quick question–I gather that the Wolverine 1000 Mile does not have much cushioning in the sole. Is this unusual for an everyday boot? And do you think it is problematic? Found your blog while I was researching for my first pair of quality boots. 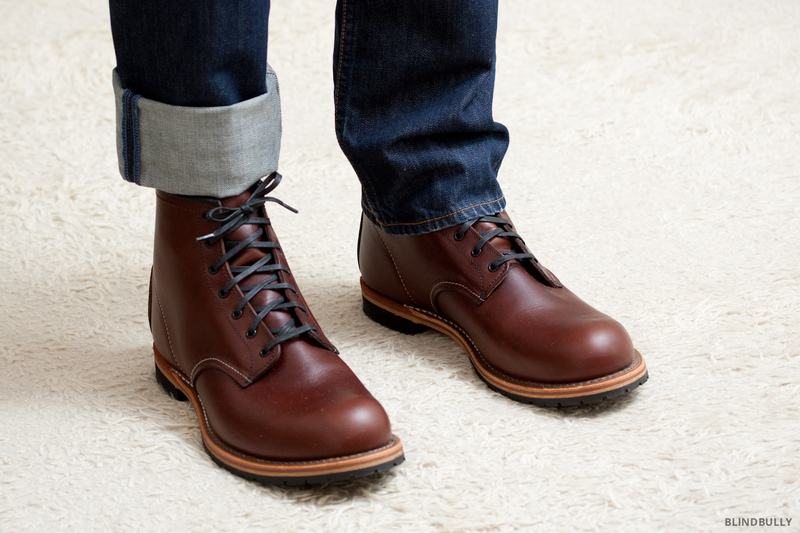 I originally was looking for information on the Oak Street trench boot ( http://oakstreetbootmakers.com/footwear/natural-trench-boot ) but after reading this post I looked into Alden boots a little more. Through that research I also became interested in the Alden 405 Indy boot ( http://www.aldenshop.com/Store/DrawProducts.aspx?CategoryID=171&ParentID=4&PageID=&Action= , or https://www.jcrew.com/mens_category/shoes/AldenForJCrew/PRDOVR~18428/18428.jsp?color_name=Dark-Brown&srcCode=GGBS00006_99101826704&sisearchengine=197&siproduct=18428&noPopUp=true&source=googlePLA&gclid=CMSfy8z8q8QCFQsKaQodZm8Avw , or https://www.jcrew.com/mens_category/shoes/AldenForJCrew/PRDOVR~A9327/A9327.jsp ) and the Plain tTe boot ( https://www.aldenshop.com/Store/DrawProducts.aspx?CategoryID=176&ParentID=4&PageID=&Action= ). I’m also considering something from the wolverine 1000 mile collection Are you familiar with any of these boots? Any feedback or advice would be appreciated. With the Indy boots I’m a little concerned about the use of neo cork or crepe soles as I’m unfamiliar with them and lean moe towards a stacked leather sole because of it. I should also note that I live in Wisconsin so the boots are guaranteed to deal with good amounts of snow. I’m not worried about gussets (my current boots that are far lower quality aren’t gusseted and I’ve had few issues over it). Love the blog and thank you in advance for any help or advice you have. Thanks for the comment. The Alden Indy boot is very popular and I should probably give it a go given the interest, but I’m not the biggest fan of the moctoe. I’d rather have the same boot in a clean-cut capped toe, but it’s very difficult to find. For more info on the Indy boot in the style I’d purchase (commando sole, full leather lining) check out MisterCrew‘s website showing two years of use. I personally don’t have any experience with the neocork sole, so I can’t opine with any insight. 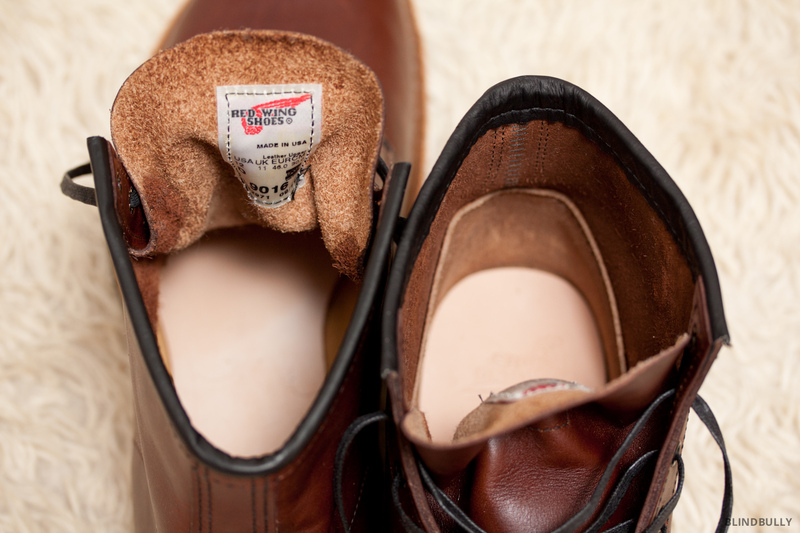 I have experience with the Red Wing Iron Ranger‘s nitrile cork sole, which is similar, but there are certainly differences in construction that could affect comfort. Similarly I’ve only had experience with crepe soles on Clarks Desert Boots not Aldens, so my experience of these soles being bad in rainy weather because they are slippery on metal (NYC Subway stair edge caps, man hole covers, grates, etc) might not apply if Alden adds an additive to solve this problem. Let me know what you end up going with. Thanks for the input Jon! Quick follow up; are you at all familiar with Allen Edmonds? Just found out about them and they seem to be very well respected p, more importantly they’re a Wisconsin company which is very intriguing for me, since I am from the state. I am indeed familiar with Allen Edmonds and have a pair of their Strand, which I’ve found to be an excellent shoe. I’ve been hoping they’d develop a nice boot, but thus far haven’t been able to make anything of interest. I tried on their Eagle County boots, but the heel doesn’t cup at all, and thus lifts every step, and given their history they have no excuse for a poorly designed boot. I haven’t seen the Odenwald in person, but I’d prefer if it was shaped more like the Dalton with a commando half sole and no broguing… I’ll keep an eye out for AE when they release their new fall boots, since they do have a better price point than Alden, but don’t quite have the styling down when it comes to boots. Why do you assume the timberlands won’t last? I have a pair that I have absolute beaten the snot out of. Mowing, salt water, covered in stain, cement, fertilizer, anything you can imagine. I can not destroy them and they are my most comfortable shoes. Thank you for your comment. I don’t assume they won’t last, I had a pair and they lasted three years, which is pretty good, but eventually the fabric liner wore through at the same time as the tread wore out. I had them resoled them, but they aren’t really resole-able (or the cobbler messed up, I believe it was a bit of both) and there was no way to fix them. Had the resoling been completed successfully, the liner was still falling apart, so I don’t think the shoes would have lasted much longer. I certainly enjoyed them though and, similar to you, I didn’t baby them–I beat them up and they took it for a long time. Had they been lined in leather and built a little sturdier they would have lasted even longer. Thanks for the question. The OSB Trench Boots are “true to length” because are accurate with Brannock foot measurements (the device you place your foot into and stand up at a shoe store to determine sizing). So if you put your foot into one of these devices and it reads 9.5, order a 9.5. 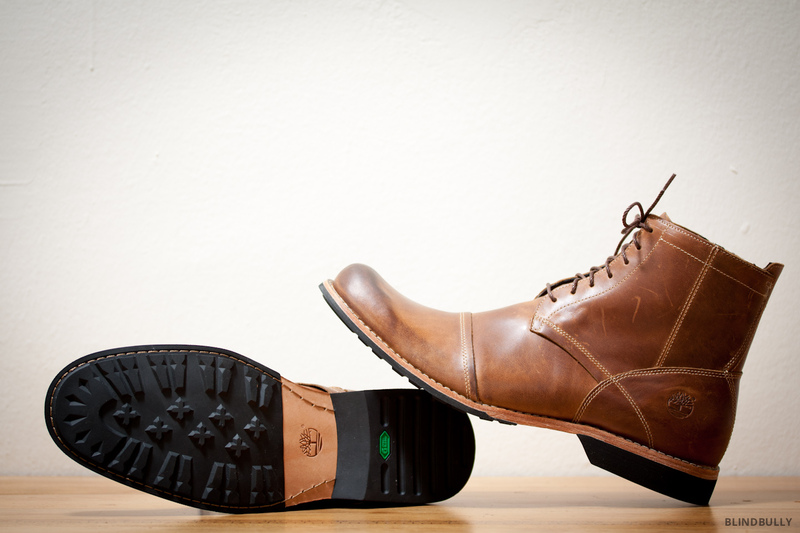 Brannock devices also measure width, however most shoe companies don’t offer every model in every width and some companies run narrow and others wide. Red Wing offer boots in width D or EE. OSB doesn’t include the width of their shoes, just length sizing, so I’ve mentioned that they run wider than average in my experience. If you have a wide or large volume foot, they should fit you well. Hey, the Alden for J.Crew Natural Cap Toe Jumper Boot looks amazing, but it doesn’t look like they are available anywhere. Do you have any idea when/where they might be available? It looks like right now it’s only available in Cordovan Color #8, which is obviously a super nice leather but is also a super expensive due to the crazy demand ($691 for the pair). have been looking at those pictures and they look like nice boots. However, at TLS I have our hiking or jump boots manufactured differently. I do not believe the stitching should go through the out rubber sole, so we construct the boots by hand with a double welt (Goodyear welt but by hand) and a double insole as a closed compartment and the rubber deep profiled sole is glued on only. That way we can assure a watertight boot since we also use Gore-Text lining sandwiched in-between the outer oiled Buffalo leather and the full lining leather. A strong steel shank gives the required rigidity. 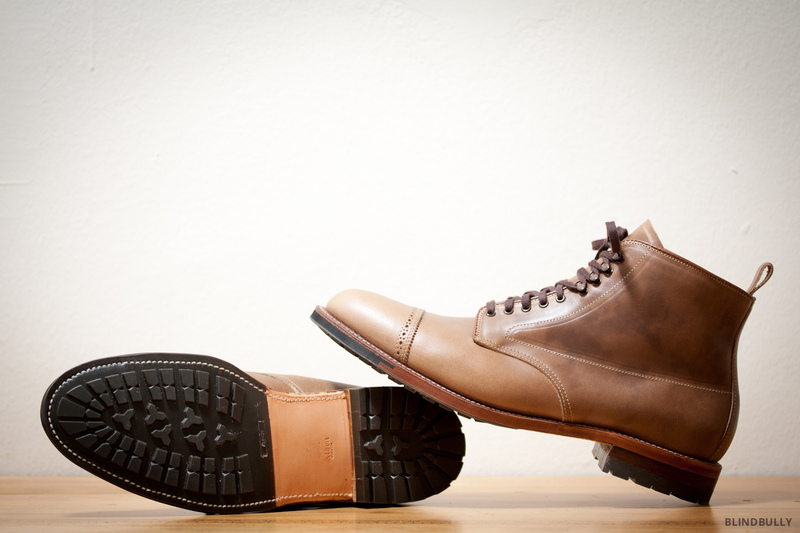 Our boots are also fully custom made to the wearers feet. Our prices start at $ 450.00 for custom made boots! It sounds like your company is making great boots. I see the stitching through the sole as a backup, in case the glue doesn’t hold as well as it should–but you’re right, it shouldn’t be necessary. I still like it though, since I know boots with stitched soles won’t have toe-sole delimitation issues (although it seems that heels falling off is a bigger issue in the boot world). Where are your boots manufactured? The wording is very elusive on your website. I ordered my latest boots from The Leather Shop. 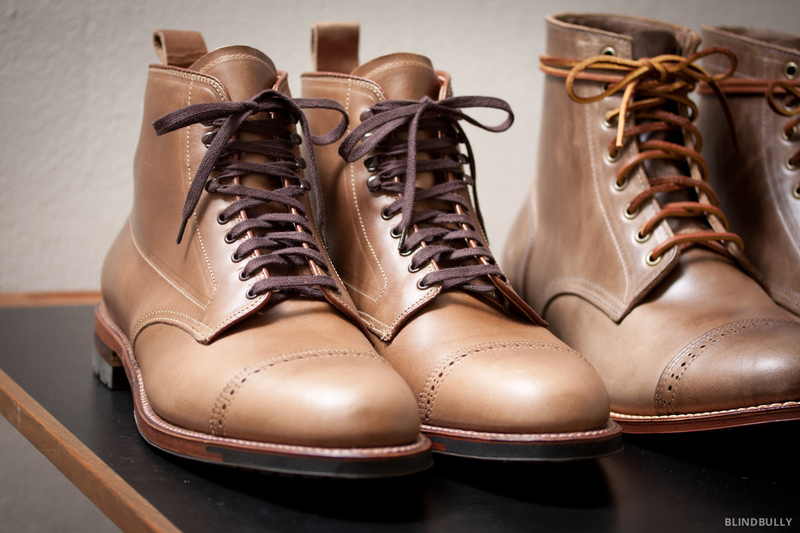 I chose The London Boot in dark brown, the Goodyear welt, and pit cured leather sole. The cost was much cheaper than I am used to paying for bespoke shoes, but the quality was top notch. I like that they sent me a test shoe to determine if the fit would be correct before sending the actual shoe. When I received my boots, the fit was better than I expected. They are handmade. The only aspect I cannot comment on is how they will hold up. I have only had them for a few weeks. I am impressed with their work and will be ordering a pair of oxfords from them next. You may want to give them a try. Thanks for the tip, please come back and let us know how they are after wearing them for a bit! I would be happy to let you know how they are holding up. So far my boots are still amazing. I wear them often because they are comfortable. I ordered my oxfords. They arrived last week. 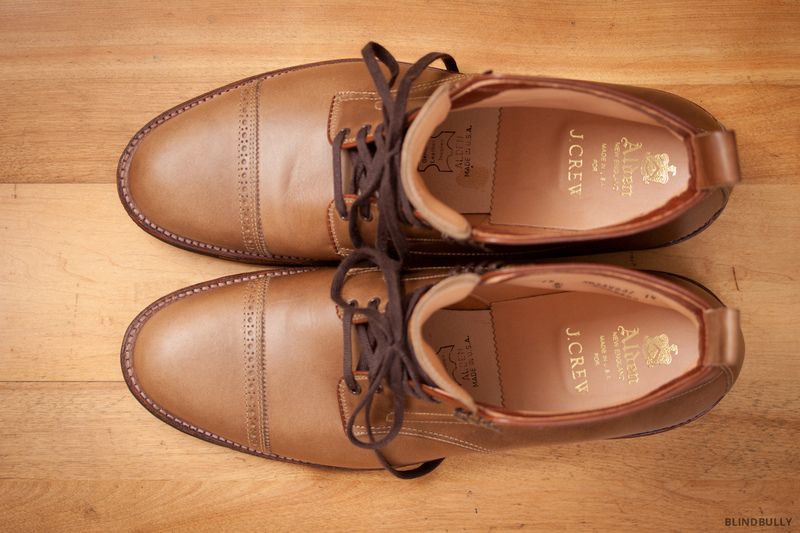 The quality of the oxfords are just as good as the boots. I am very surprised by this company I had never heard of! Are you still impressed with the boots you ordered? I am planning to buy my husband a pair for Christmas. I am interested in custom made because he has VERY large feet. I had never even considered custom made until recently. Basically I am looking for reassurance this is a reputable company. Thoughts? First off thank you for doing this review. It gave me a lot of insight which ultimately led me to not one, but two pairs of Wolverine 1000 Mile Rugged Boots (brown and black). I wanted to share my experience with a few pairs of boots that made their way back to the retailer, as well as my experience with Wolverine customer service. Prior to ordering the Wolverines, I ordered a pair of made in the USA Frye Arkansas. I wore them for 3 days before I noticed that the stacked heel had developed a large crack in it. I gave it a wiggle, and the stack just above the rubber heal came off in my hand. One call to Sierra Trading Post and they sent me out a new pair. I inspected the boots before putting them on, and noticed the same faulty cracking in the heel. These were not seconds, they were first quality. I sent them back, but I wasn’t willing to take a chance on a third pair. About a week later, Amazon was having their fall sale, I snagged a pair of 1000 Mile Rugged boots in brown size 9, Red Wing Beckmans in Black Cherry. Thanks to Prime shipping I received the boots in two days. I opened the Wolverines first. They were absolutely beautiful as I expected from your photos. Next I opened the Red Wings. First off, I was quite surprised by the black cherry color. There didn’t seem to be any “black” present and they definitely didn’t look like any photos that I saw online. They were very dry, very scarred and very pink in color. On top of that they seemed to be worn. Not what I expected considering they were shipped and sold by Amazon. Back they went, but let me quickly compare them aesthetically to the 1000 Milers. I would definitely say the Beckmans are more rugged looking compared to the Wolverines. They are much heavier in weight, and I much preferred the low profile toe of the 1000 Milers to the “bulbous” toe of the Beckmans. It’s not that I didn’t think the Beckmans weren’t nice boots, but I just preferred the slimmer, more dressy look of the Wolverines. I was really surprised of the “first quality” that Red Wing allowed to be sold by Amazon, so as you mentioned, you definitely may want to inspect quality in person. Now, on to the Wolverines. I wore them for about a week, and as they broke-in they seemed to be getting smaller on my left foot. Full disclosure, my left foot measures a 10 and my right foot measures a 9. My Allen Edmonds Strands are 9.5’s but upon my first few wears of the Wolverines in size 9 they were great. After about a week, I noticed that my big toe and pinky toe were hitting the edge of the toe box. Did I just make a costly mistake by ordering the wrong size? I hopped on the Wolverine online chat and explained my situation. The customer service agent told me that my 1000 Milers weren’t typically covered under their 30 day comfort guarantee, but they would make a one-time exception and exchange my boots. After emailing me some paperwork, as well as a pre-paid FedEx slip back they went. About three days later, I received a phone call from my customer service agent. She asked me a few questions and made sure that I wanted to size up. Upon my answer of “yes” she said I would have my boots in most likely a week. Two days later the FedEx guys showed up with my new size 9.5 boots. I was so impressed with their service and willingness to go the extra mile (no pun intended), I decided to purchase another pair in black. I have no affiliation with Wolverine, nor any of the retailers that I mentioned, but my experience with Wolverine was excellent. The boots were comfy right out of the box, and I can’t stress how beautiful the craftsmanship is. With great service and excellent craftsmanship, they have earned a customer for life. Edit, I meant my right foot is a 10 and my left foot is an 11. PS, sorry for the long winded response, I just wanted to share my experience. Thanks for your comment, it’s great to hear of such high caliber customer service from an entrenched brand. I agree with the low toe too, it’s a sleeker look. Thanks for the post. I’ve heard good things, but have yet to try them or seen them in person myself. Let us know what you think when you get them! haha…the other boots will last longer than the Timberlands. Really? The heels fall off of the Wolverine 1000 mile boots all the time. They are only held on by 6 little nails and no glue at all. Here’s Wolverine’s own video regarding the construction. https://www.youtube.com/watch?v=w4-ZFoZqus0 go to the 2:42 minute mark to see that it is just 6 little nails holding the heel on. Not very good construction. Check reviews on Amazon, look in the style forum and other places. The quality of the Wolverines isn’t very good at all. Thanks for your comments. I have heard about the heel problem, and looking at the video, you’re right, it’s absurd that they only use small tacks without any adhesive. You’d think they’d at least add a dab of glue in the middle now that it’s a known issue with their boots. I found the reviews on Amazon were hard to filter, since many people were claiming they’d been shipped factory seconds at full price. Amazon should clean that up, and Wolverine should fix the known issue. Have you continued to see this as a complaint in reviews in 2015? If they have fixed the problem, would you know? I find this especially interesting given Wolverines lack of interest in extending their private label manufacturing for Patagonia and instead focusing on their heritage collection, which has been making them more money and without pressing for tighter environmental performance. Given the focus, brand perception and quality should be of upmost importance. Some of the Amazon reviews might have been due to the fact that one reseller was selling factory 2nd and not telling people. Maybe I’m over reacting, but I’ve seen way too many complaints regarding the heels. I guess it is possible that only those with problems go online to complain, but still, six little nails doesn’t seem like that great of construction. The first video link I posted was for the Wolverine 1000 Mile Centennial boot, but I also found another Wolverine video showing how they build the original Wolverine 1000 Mile boot here https://www.youtube.com/watch?v=fNSnsuWugzg In this video, at the :56 second mark, you will see them attach the heel with just the six nails too. I’m not sure how the other manufacturers attach the heel, compare Wolverine to the way Redwing does it here http://redwingheritage.tumblr.com/post/67565362624/how-theyre-made-nailed-heel-construction This seems to be way more secure. I bought my 1000 Miles a year ago, and have worn them almost every day since. I haven’t had a problem with the heels falling off or any other complaint. The heels are showing definite signs of wear, and will probably have to be replaced in a few months, but I walk a lot. All in all, I’m still quite pleased with the purchase. I was thinking about buying a second pair in another colour. Fantastic review. 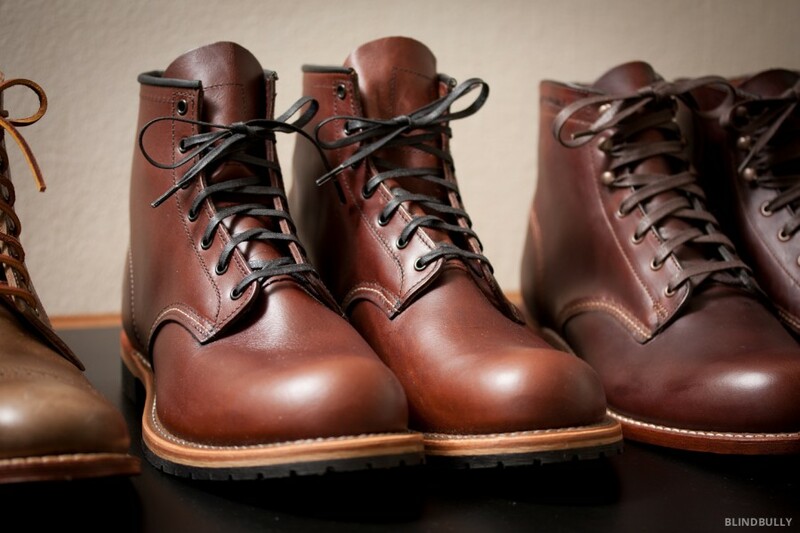 I have been planning on buying a pair of Wolverine 1000 mile boots. I have a wide foot and these come in 3E. However, I really like the Oak Street Boots. You mention that they run a wide. My dress shoes are 10.5 EEE. Casual shoes and sneakers I usually wear an 11 wide. 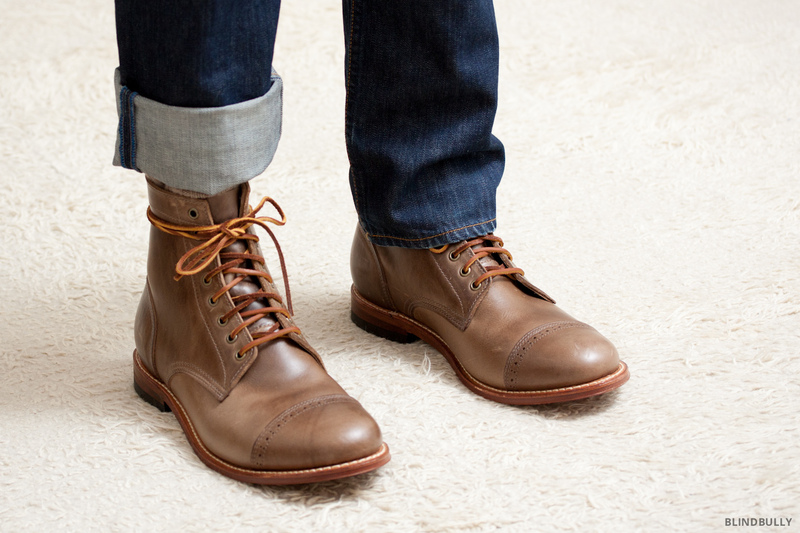 Do you think an 11 in the Oak Street Boot might work? Thanks for the comment. I suggest reaching out to Oak Street directly (info@oakstreetbootmakers.com) regarding sizing as they’ll have a more accurate answer. I’ve never tried on a EEE shoe, so I have no knowledge to work from. Good luck! Great review and follow-up commentary, though sadly I’ve read it too late! I recently received a pair of Wolverine 1000 Miles that I ordered directly from Wolverine. 10 minutes after I put them on the heel came off! I’ve been in contact with customer service, but no response yet. After reading about their construction technique, I’m unsure as to whether I should return them or have them repaired. I love the look and comfort of these boots, but don’t want to deal with recurring heel issues. I read that Oakstreet trench boots are wide by your experience. Do you find it wider than a Redwing 875 E width? Tks. Thanks for the post. Unfortunately, I’m not sure how the Oakstreet compare to the RW 875. Good luck with your search! I wish my Wolverine 1000 mi boots felt as good as they look when I wear them. Don’t know if it is the way the sole is constructed, but the ball and heel of my feet feel sore after a day of wearing them, even with felt inserts for extra cushion. Well constructed shoes are important to me. (I own my second pair of Alden cordovans.) But comfort means as much to me as durability and design, and in the comfort category, the 1000 milers let me down. Thanks for highlighting the brands that come too wide in size 13 (like most dress boots from Loake, which I had to ship back to London, because they didn’t specify widths at time of sale). Great review. I have it bookmarked as reference. 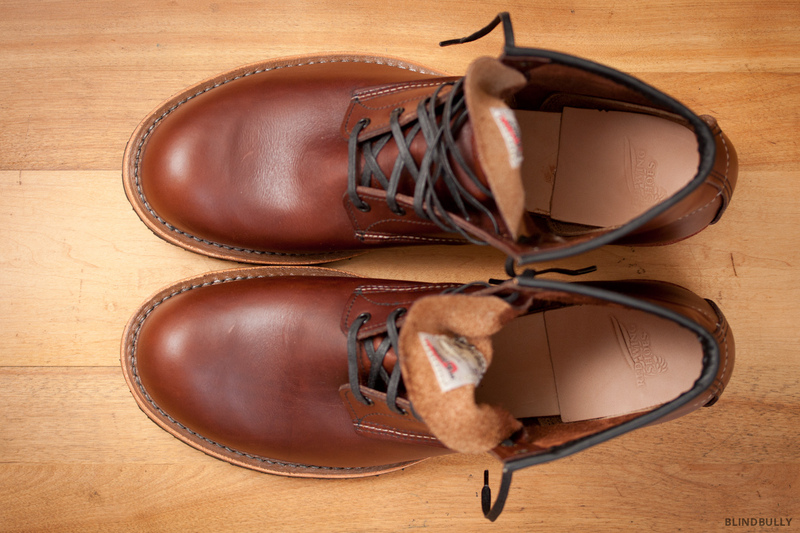 Quick question: if I’m comfortable with a size 8 Iron Ranger, would it be advisable to get a size 9 OSB Trench Boot? Thanks in advance. No one will likely read a comment this far down the chain, but I have a pair of the Timberlands and I love them. They are my only shoe and I have worn them Literally every day for the past 4 years. I have had them resoled twice and when I go in for a job interview I have my guy polish them with a smokey toe and they look Sharp! That being said, I live in CA and don’t have a lot of elements to contend with. However, these were my first boots so I may not have the highest standards. I am looking for another boot so that I can alternate these and I really appreciated your review. I would have never thought twice about plastic caps and synthetic liners. That being said, since I haven’t noticed them by now so it may never be an issue. 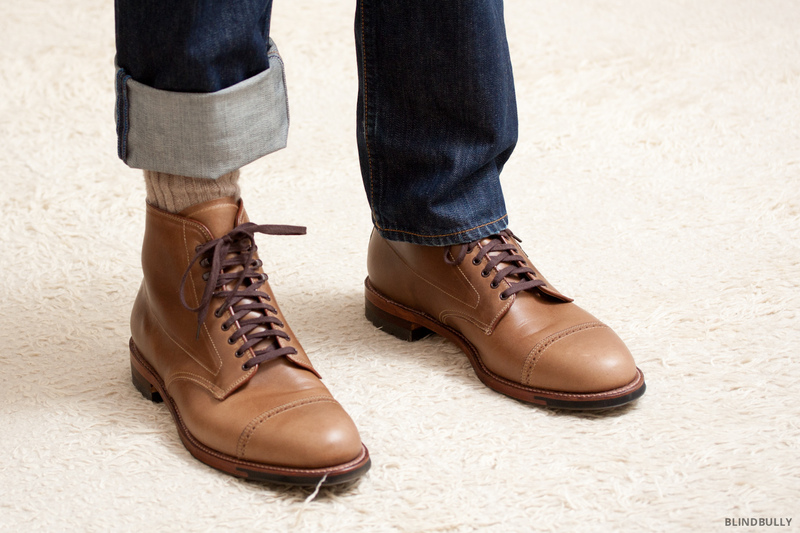 I Have always thought that the toe was a little long, but most people just chalked it up to a common boot styling. However, I’m so damn happy with these that I may buy another pair in black. I love the side zip, especially since I’ve had a kid and often throw these on one-handed. One additional note, I appreciate that Timberland is Trying to be environmentally conscientious. Along with that, they sponsored a tree planting in my hometown so I have a little loyalty to them for that (even if it was a publicity stunt). I’ll take my Thursday boots over these any day of the week. I owned Wolverines and Aldens plus have those exact Timberlands. Nothing compares to the Thursdays I have.